Kyle Walters averaged more than 22 pounds per day en route to winning the FLW Series Championship at Lake Guntersville. Kyle Walters has a pretty good life in Florida, running his custom-home building business and, along with his wife, raising four active children ranging in age from 11 to 17. The 40-year-old could hardly be blamed, however, if he packed the family up and relocated to Alabama. 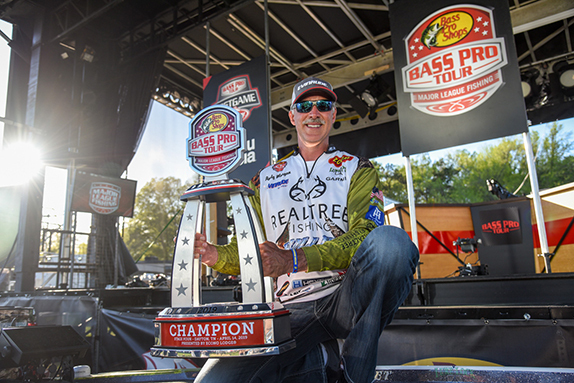 He's been to Lake Guntersville twice � for a 2013 BFL Super Regional and last week for the FLW Series Championship. He went home with a trophy and the biggest paycheck available on both occasions. "Maybe I should move there and just start fishing for a living," he said with a laugh. "Really, though, I've just been fortunate to get on some good schools of fish there and I've been able to fish the way we do in Florida 12 months out of the year." He flipped grass to amass a total weight of 44-03 in an event that was shortened to two days due to powerful that canceled the scheduled opening day. 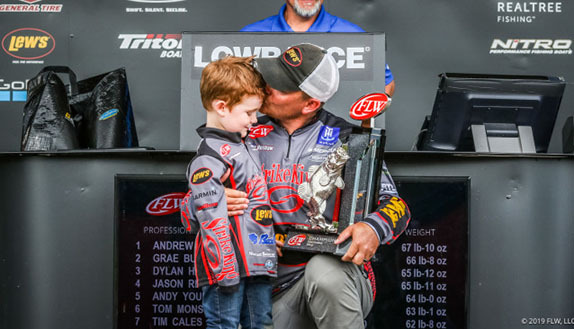 He trailed early leader Carl Jocumsen by 3 ounces heading to the final day and then caught a 24-04 stringer � the heaviest of the derby � to prevail by more than 4 1/2 pounds over the runner-up, FLW Tour star Bryan Thrift. The victory, worth more than $92,000 in cash and prizes along with a berth in the 2019 Forrest Wood Cup, was easily the most significant of his career. This marked just the second year in which Walters had fished the entire Southeastern Series schedule (the previous time was all the way back in 2004). 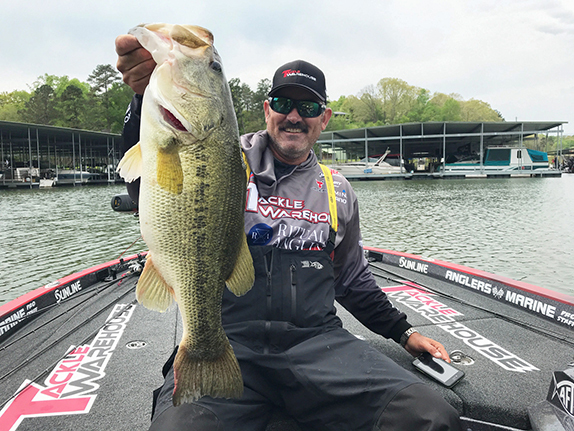 His motivation this time was simple: He wanted to qualify for the Championship at Guntersville and see if he could go 2-for-2 on the famed Tennessee River impoundment. "Normally, a plan like that doesn't work out," he noted. He described his practice as "pretty good." He found some grass (milfoil, hydrilla or a mixture of both) up the river in the vicinity of the B.B. Comer Bridge that was holding fish in 5 to 6 feet of water, although he was initially unsure about the quantity. He concluded practice with three locales that he had confidence in, but the specific place where he'd planned to open the competition got completely blown out during the canceled day. What he'd originally regarded as his No. 2 spot ended up producing eight of the 10 fish he took to the weigh-in stage and the third surrendered a couple of big ones that bolstered his bags. He had his primary area all to himself, although fellow Floridian and eventual 3rd-place finisher Robert Crosnoe was in the same vicinity. "We could see each other, but we weren't on each other's water," he said. His hefty sack on the final day came together rather quickly � he compiled the vast majority of his weight between 9:30 and 11 o'clock. The haul didn't contain a true monster, as a 6-pounder was the biggest of the quintet. "Once I got settled in and they started biting, it was a good day," he said. "I felt like I was in real good shape at that point. At a minimum, I'd made it so that somebody else was really going to have to catch them. I felt pretty good." He said he's been asked a couple of times in the wake of his triumph whether he thinks he would've won has all three scheduled days been contested. "You really don't want to have to fish another day with Bryan Thrift right on your tail, but I was on a pretty good pattern and I think I could've caught them again. Of course, I'll never know for sure." > Flipping gear � 7'11" heavy-action Halo J.T. Kenney Signature Series rod, Abu Garcia Revo STX casting reel (7:1 ratio), 75-pound Halo Winch braided line, 1 1/2-ounce Picasso tungsten weight, 4/0 straight-shank hook, Gambler Stinger (green-pumpkin/black-blue). 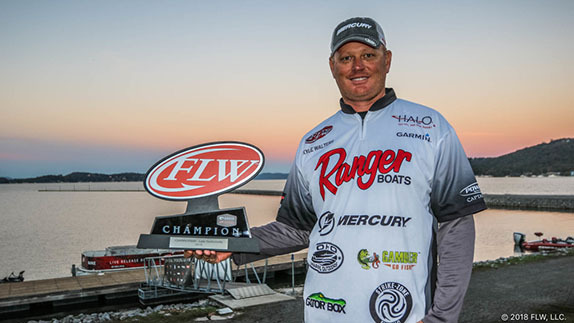 > Walters plans to fish the Southeastern FLW Series again in 2019, but will spend much of the first half of the year preparing for the Cup, which will take place in August at Lake Hamilton in Arkansas. "I've never been to Arkansas, but I'm real excited right now and I'm looking forward to it," he said. "To be able to go forward and represent the guys on the Costa FLW Series is awesome." > He'd like to compete at the tour level at some point, but that's not currently an option. "Right now I've still got kids at home and they're playing baseball and doing a lot of things like that. There are certain things that I don't want to miss. Once they're grown up and out of the house, I might reconsider."